The crew has made good progress! They have opened two quarries. This picture gives a little perspective. Sometimes, when you are working them, the sites don’t seem all that impressive. But stepping back a bit to see all of it is pretty cool! It is a lot of backbreaking work, but no one complains, and all pull their weight. 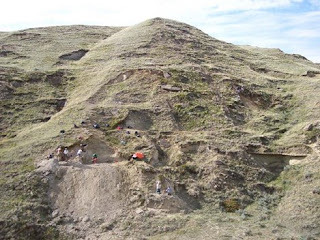 I think paleontology is the perfect example of a completely egalitarian effort. No patience with slackers in the field….I think it is a great experience that all students should have! (not at all prejudiced, though). You can tell this isn’t easy work. It is a far cry from the Indiana Jones scenarios. There is nothing at all glamorous about this backbreaking work. I love it tho—men and woman work equally hard, and earn the respect of each other. They move mountains, quite literally. I am always honored to be part of these crews. And I learn at least as much from these students as they ever will from me. Bob and I walk out a bunch of gullies and outcrops. We revisited a site that our crew had worked about ten years ago. There are still bones coming out. 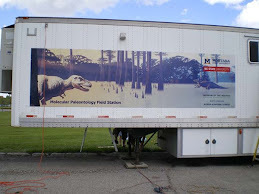 I don’t think the crew missed anything, but maybe there is more than one dinosaur here! Taking advantage of the shade to look a little closer at these bones…. So, back to camp, and relaxing after a full day…these guys work really hard, and the evening is when everyone just lets down. You never know what will come up in conversation, that is for sure. But I couldn’t resist this shot below….what a great advertisement for this trailer, and joint effort. Relaxing after dinner in the shadow of the new lab….there are students from all over, and from all disciplines. It is so much fun to watch them all. What a great group! Well, it has rained the last two days. I woke up to lightning flashing on my tent wall, and lots of rain, in the middle of the night. it is peaceful, I love sleeping in the rain, but we all know that it won’t be an early day of field work. 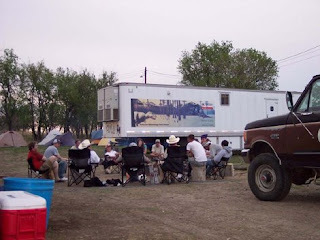 So the camp is relaxed, with people slowly wandering in for breakfast, and it will be down days of reading, playing cards, and catching up on paleo news. Students swap stories of evil professors and bad field experiences. Occasionally, research projects get discussed. Friendships form, and opportunities for collaboration come out of these experiences. We are hoping that it will stay dry today, so that we can get on the overburden tomorrow but the clouds are building and the wind is picking up. We have part of the crew in town as one student has an ear infection, but he did pick a good day to do this…. Well, I think that is a long enough report for now. 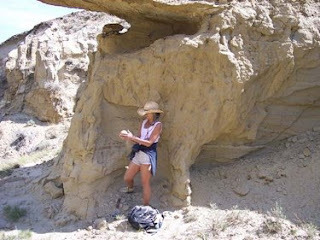 Will catch you up if we turn up more dinosaur stuff, otherwise, I will be back in the field in late June….